With the start of the New Year, we often put a lot of pressure on ourselves to be better, healthier, more organized, etc. We convince ourselves that we can change decades of bad habits and stick with it the minute the clock ticks from Dec. 31 to Jan. 1. But maybe with resolutions, we don’t need to be so resolute with ourselves. Sometimes it’s best to decide not to decide just yet. Keep your goals in mind, but remain open to possibility and unexpected outcomes. 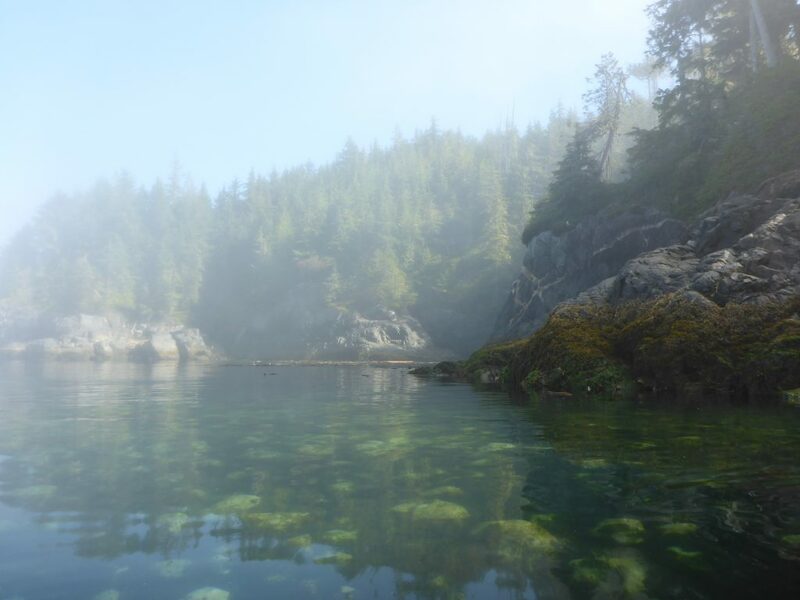 Last summer I had the good fortune to go on an amazing 4-day kayaking trip with my family in the Johnstone Strait, off the coast of northern Vancouver Island. We went in August when we would be most likely to see orcas, an animal that has been at the top of my mom’s wish list for decades, although there were no guarantees. Even though there are 3 resident pods of orcas in that area, they are wild and could show up anywhere at any time. And we intended to be ready for them, paddling in our kayaks, floating and waiting. Day 3 of the trip stands out as a highlight in my mind. We started paddling that morning in a thick fog, obscuring the landscape in a blanket of wet, gray mist. The edges of the land peeked out enabling us to use the shoreline to guide our path. Some birds hanging out on the bull kelp. Suddenly, we heard loud smacking and cracking noises ricocheting off the haze around us. Humpbacks! They were close. We could hear them, but we couldn’t see these massive 40-ton animals sliding through the fog. It was eerie, exciting, and magical, all at the same moment. The fog started to clear as we disembarked on land for a small break. The fog starting to clear as we took our morning break on land. Each passing minute revealed more of the landscape. Every turn offered a new vista, stunning and pristine. 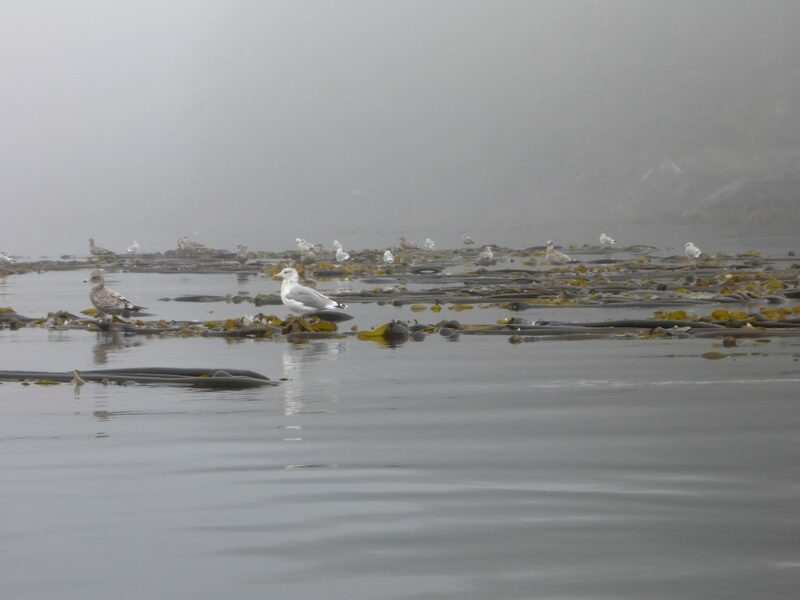 We paddled close to seals, splayed out on the rocks in an array of tawny and gray colored bullet shapes. Bald eagles dotted the trees with their bright white heads, surveying us from above. 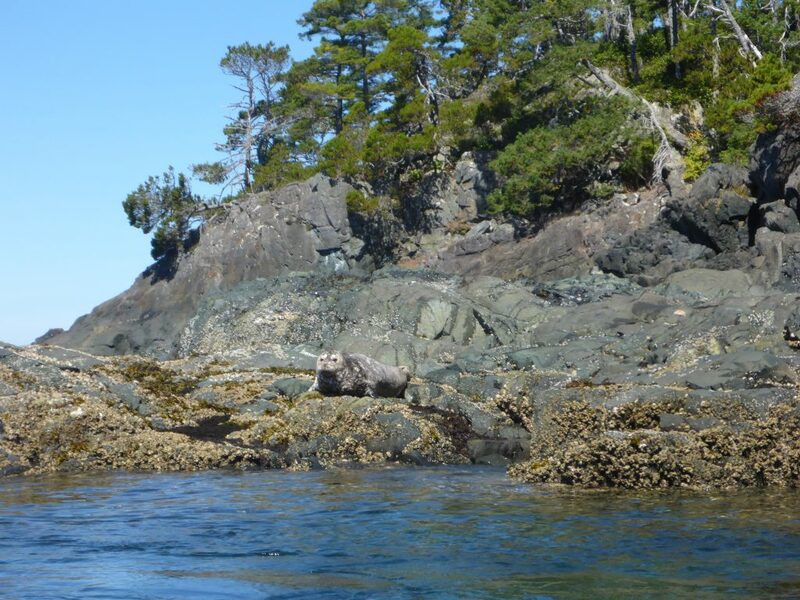 A seal peered at us curiously as we glided by in our kayak. In the afternoon, orcas! We were lucky. Our kayaks were right in the middle of a few orcas swimming by. 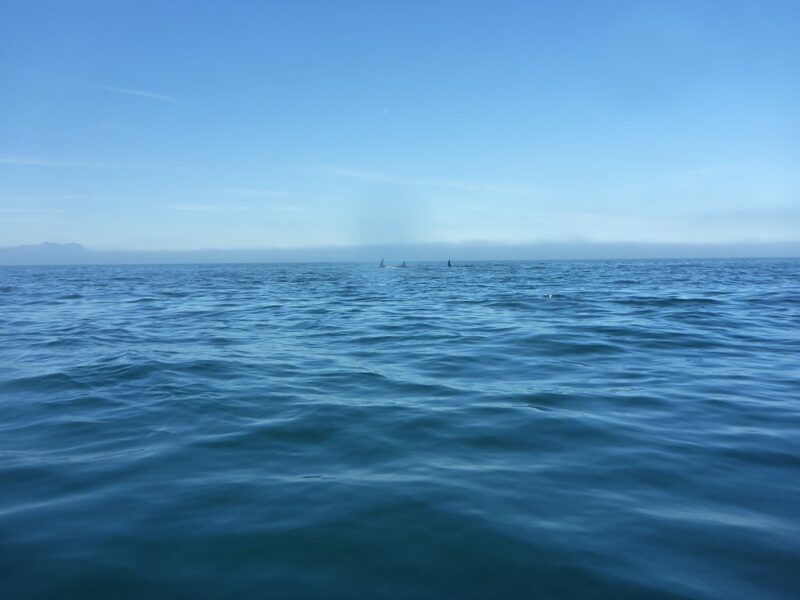 The dorsal fins of three orcas cutting through the water near our floating kayaks. Sometimes when you just relax and spend time floating, the best things come your way. If you’re too resolute about what’s supposed to happen when, you may miss out on alternate possibilities and unexpected, yet delightful, outcomes. Love this …. so true… Beautiful ! Very good and perceptive observation. Just float until the orcas or whatever stop by. Just keep your goals in mind.